1. The whole thing smacks of the Addams Family. You remember The Addams Family, don’t you?. First they were a cartoon series in The New Yorker, then a hit TV sitcom in the 1960s. The Addams Family, not to be confused with the Munsters of the same era, made the macabre look normal. Speaking of the macabre, a “bucket list” is a compendium of things you want to do before you “kick the bucket.” Hence the name “bucket list.” Death and fun just don’t seem to belong together. Too creepy for me. 2. I worry about what happens when I complete my bucket list. When you finish your bucket list, do you just kick the bucket? Or do you add more items to your bucket list to hold the Grim Reaper at bay? I figure I’ve got a good 30 or so years left and I’m not about to jeopardize that by running out of things on my bucket list. 3. 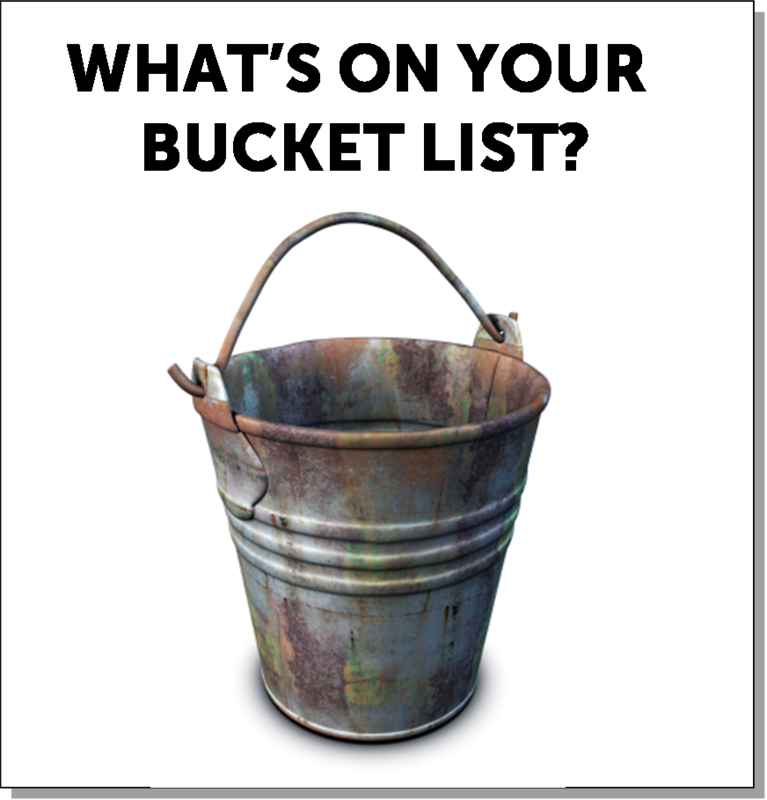 Once you put something on your bucket list, can you take it off? Suppose I decide I’m getting a little too old to climb Mt. Everest? Can I take it off my bucket list? And if so, do I have to put something equally exotic back on my bucket list? And what happens if you take lots of stuff off your bucket list, and then you finish it? Which brings us back to item #2 above. See, there’s no end to the anxiety involved in making and maintaining a bucket list. 4. I would be guilty of bucket list envy. Suppose I’m at a party and we’re talking about bucket lists. I say a trip to Disney World is on my bucket list. The guy next to me says, “I plan to wrestle alligators in the Amazon.” Which may be the last thing on his bucket list, but still it trumps my Disney World and ups the stakes. What if your bucket list is better than mine? Can I copy off someone else’s bucket list? 5. I find the whole idea of planning my life around a series of things to do before I die rather disconcerting. I know this sounds a lot like #1, but there is a nuanced difference. Creepy is one thing, but to have my whole life oriented around the phrase “before I die” — a.k.a., “kick the bucket” — seems to me to be weird, not to mention morbid (back to #1, again). 6. Finally, I don’t have a bucket list because I believe in cliches. Frankly, I had rather go right on living my rather simple life of pastoring a small church, reading good books, only going places I can drive to, and seeing my grandchildren often but not too much. Not much of a bucket list, but then it’s not creepy and it’s worked for me so far. Gomez Addams, take note! Here’s the sermon I’m preaching on New Year’s Day Sunday, January 1, 2012. Whatever 2012 holds, the point Luke is making in this story about Simeon is that Jesus changes the future. 36 There was also a prophetess, Anna, the daughter of Phanuel, of the tribe of Asher. She was very old; she had lived with her husband seven years after her marriage, 37 and then was a widow until she was eighty-four. She never left the temple but worshiped night and day, fasting and praying. 38 Coming up to them at that very moment, she gave thanks to God and spoke about the child to all who were looking forward to the redemption of Jerusalem. 39 When Joseph and Mary had done everything required by the Law of the Lord, they returned to Galilee to their own town of Nazareth. 40 And the child grew and became strong; he was filled with wisdom, and the grace of God was upon him. This is the first day of 2012. Already around the world journalists have chronicled the changing of the calendar, reporting on the ceremonies and celebrations that ushered out the old year, and ushered in the new. The oddest of all those celebrations was in Samoa where they decided to move themselves across the international dateline. The Samoans made the switch by eliminating December 30 this year. Asia and Australia are roughly 12-or-so-hours ahead of us here in the United States, so it’s already new year’s night there. In any event, when you fly to Samoa now you’ll cross the international dateline and leap ahead into the next day. This idea of a new year resonates with our society because it also holds the promise of a new you – new beginnings, a new start, a fresh opportunity to do the things that we missed out on in 2011. As this new year dawns, there is no shortage of those who predict the trends for 2012, and even some who predict actual events. Interestingly this year most predictions seem to center around either politics or the economy or both, which doesn’t require one to be psychic to hazard a guess in one direction or another. We seem to want to know what the future holds by giving it our best guess, and when that doesn’t work out, we look forward to the next year, and go at it again. With all this talk about the future, it’s fitting that the lectionary Gospel reading today comes from Luke 2:22-40. It’s one of my favorite stories around the birth of Jesus because it features two very ordinary people, Simeon and Anna, and their extraordinary vision of the future. Let’s deal with Simeon first. We actually know a lot about Simeon. He lived in Jerusalem, which is not surprising because Jerusalem is the civic and religious center of the nation. Jerusalem contains the Temple. And so Simeon is referred to as “righteous” and “devout.” Which means in simple language, he lived an upright life observing all the Jewish laws and practices, and he participated in the ceremonies in the Temple. So, the Messiah, the Christ, was going to be seen by Simeon before he died, that’s God’s promise to Simeon. Simeon had seen the future of Israel, and it involved the presence of the Messiah, God’s Anointed, the Christ. And of course, Simeon is convinced that the baby Jesus, child of Mary and Joseph from all outward appearances, is the Messiah. Okay, right here let’s take a reality check for just one minute. We have an old man, Simeon, to whom the Holy Spirit has revealed that before he dies he will see the Messiah in the flesh. How unlikely is that? Well, it’s very unlikely. First of all, no one who hoped for the coming of the Messiah had any inkling that the Messiah would come as a baby. Because after all, a baby has to grow up, and that takes years. Thirty years in Jesus’ case, to be exact, before he would begin to preach and teach, and demonstrate the presence of the Kingdom of God through signs and miracles. No, everyone in that day who was still looking for a Messiah – God’s Anointed – was looking for someone to deliver Judea from the Roman occupiers. A baby couldn’t do that! The prevailing thought was that a grown man, would be revealed as the Messiah, and then he would vanquish the Roman army, and restore the nation to its former glory. So, if Simeon is looking for the Lord’s anointed, he should be looking at young men who are strong, fearless, and ready for a confrontation with Rome. But instead Simeon zeroes in on Mary and Joseph, and little baby Jesus. Mary and Joseph are in the Temple to offer the sacrifice for her ceremonial cleansing, which was necessary so that she can move from the experience of childbirth back into to normal society. A Temple sacrifice was the only way to make that happen. Simeon’s future is very near: he can now die in peace because God’s promise has been fulfilled to him. But the future also has an interesting twist to it. The future of God’s people Israel, also belongs to everyone else. Jesus is God’s “revelation” to the Gentiles. In other words, the future of God involves everyone else, and not just Israel. But the Messiah is also for the “glory” of Israel. I think here that Simeon is saying that God will shine a spotlight on his people, Israel, because God’s salvation (which is what the name Yeshua or Jesus actually means) will come from Israel and will be a blessing to all the other nations of the world. The future involves everybody, in other words. And despite the popular idea among the first century Jews that they were God’s unique people, Simeon knows and reminds Mary and Joseph that he has seen God’s salvation (Jesus) for everybody. If the future of God is about everybody, all nations and not just Israel, then how does Jesus go about changing it for everybody? Even though Simeon has seen “God’s salvation” in the baby Jesus, it will take 30 years for that “salvation” to begin to be announced to the world through Jesus earthly ministry. According to Luke’s Gospel in chapter 4, Jesus begins his ministry by announcing what he is going to do, and how he is going to be able to do it. Of course, some in Israel will not interpret this as the promise of a messiah. Many will think that this passage means that God is coming back to Jerusalem, back to the Temple (once it is properly rebuilt and restore). And, that is true, but this time God’s presence in the Temple will be in person. God will show up, but he will show up as a little baby, who will be both the light and glory of God. The future means that God will return, and that Israel will be blessed to be a blessing to all the nations. But Simeon was right to also understand that Jesus’ life and message would create conflict and division. Very shortly after the people of Nazareth marvel at Jesus’ teaching in their synagogue, they turn on him and he leaves Nazareth, a prophet without honor in his own community. But the future God has planned still remains in place. Jesus, anointed by God’s spirit in the tradition of the anointings of kings like David, means literally that he is God’s Messiah, the Anointed One. It also means that his ministry will be just as Isaiah predicted, and just as Jesus read. The return of God to make things right. To preach “good news” which is the gospel, to the poor; to free the prisoners; to make the blind see again. All of this brings us back to today, the first day of 2012, a new year. What does the future hold for us? Exactly what it held for Jesus because his future becomes ours. In this passage, Jesus tells us about our future. The same cast of characters is here – Jesus and all the nations. But this is the ultimate future, the end of time as we know it. And Jesus is telling us plainly what our futures should have been about. We should have been feeding the hungry, clothing the naked, caring for the sick, helping the prisoners. In other words, this is the real life application of Isaiah’s prophecy, and Jesus’ announcement of what his ministry would be about. The poor from Isaiah now become those who are hungry, homeless, or need clothes. The good news for them is that someone cares for them and provides for their needs. Those who are sick are cared for, cured, healed, and restored to their rightful place in the community. These could be the oppressed who due to ill health such as leprosy, or other debilitating diseases, are cast out of their own homes and families. And those who are prisoners are cared for, freeing them from the stigma of their positions at the bottom of society. The point of all of this is that our future is inextricably tied to Jesus’ future, which was the fulfillment of the promise of God written about in Isaiah. So, if you’re wondering what the future holds in 2012, for followers of Jesus its that same as it was in the year 112, or 1312, or 1912: we are to continue to live out the life of Jesus to the world. God’s future is our future, now and forever. In the on-going debate “will digital replace books?” the conclusion of many media watchers is an unequivocal Yes and No. Amazon’s Kindle has really become a game-changer, delivering books within seconds of purchase via Sprint’s wireless network. Problems do exist, as Jeff Jarvis points out, because if you do not have good Sprint coverage in your area, books take hours to download, not seconds. In other words, it’s not perfect. So, will digital replace books? Yes, ebooks will replace printed books for many, maybe even most. But, printed books will still survive in print-on-demand processes that print each copy as ordered. Books will also survive in niche groups like “Save the Real Books” (which I just made up, but you get the idea). After all, there are groups for vintage cars, vintage wine, vintage clothing, vintage furniture, so why not vintage book printing? Digital won’t eliminate printed books, but digital will be another means to acquire and read books. In other words, rather than one model (printed books), we’ll have a network of niche models from which to choose, including print, digital, audio, digital audio (the new Kindle can read your book to you), digital mobile, and so on. Which brings us to churches, again. Using the ebook versus printed book model, what does that say about churches? I have been saying that we’re counting the wrong things in church (attendance) when we should be counting community engagement. I’ve also said that church attendance will decrease (this is not an original thought), and we’re moving rapidly toward a post-Christendom era like Europe. That said, I don’t think all existing churches will die. For instance, the megachurches spawned by baby boomers will not go away. I think their influence will diminish and some will go downsize. But churches will always exist, some will always have buildings and property, and most will always be trying to attract people to them. But, what I think will happen is new forms of church will emerge from the next generation of church leaders. These forms are not even thought of yet. Example: A few years ago who would have thought of LifeChurch.tv with an internet campus, and a bunch of satellite sites? Lyle Schaller came close in the 1980s when he advocated that small churches use video sermons from outstanding preachers, but Schaller did not imagine that video sermons would be simulcast to remote satellite locations where a live band would lead worshippers in person, cutting to the remote video of Craig Groeschel (or Andy Stanley) in time for the message. To get back to our question, Will churches of today disappear? Yes and no. We can be certain of this — we live in an age of discontinuous change and unexpected consequences. Nobody knows exactly what church will look like in the future because we’re not there yet. But I have a feeling it will be multiple models, not one predominant model like we had from WWII until about 1985. That’s about the time the church growth movement popularized church planting by anybody, not just denominations. That shift resulted in hundreds of new churches, led by entrepreneurial church planters who created different models. That is what I think will happen, again, but this time the new models will be even more innovative than those of the last 25 years. We’ll still have bricks-and-mortar churches, but also house churches, coffee shop churches, outdoor churches, churches that meet once a month, churches that meet online, churches that consists of groups which interact frequently, and churches that we can’t even imagine yet. We will also see ‘single market’ churches that focus on the homeless or the physically handicapped or the poor or any niche group you can think of. In other words, the same thing that is happening in the broader culture will happen in churches, too — more options, more models, a network of niches, rather than a predominant church form. I am also certain that whatever emerges, church will not ever be the same again. By extension, neither will denominations, cross-cultural missions programs, or Christian education programs be the same again. These will all change radically, because the current models are unsustainable in today’s culture. Thanks to Bobby Gruenewald at LifeChurch.tv’s Swerve blog for bringing this video to our attention. It’s about 5 1/2 minutes, but you will be amazed. Watch it. The future is here. — My friend rlp has a great post, Web 2.0, on writing in the brave new world of the web. If you’re a blogger, writer, or just love words, check out his post. I also shared it under the Trends of Interest feed to the left. — rlp also clipped this video, which I am now clipping. This is good, clever, and seriously creative and explains what has happened to information in the last 10-years. Today Amazon officially announced Kindle, their new e-reader. Very cool. And of course, it’s tied to Amazon. Kind of like iTunes for words. The interesting thing is Amazon needs content to feed Kindle. So not only is it a book reader, but it’s also a blogreader (yes, my fellowbloggers), a newspaper reader, and a Wikipedia reader all-in-one. Plus it stores you own docs, and works off cell technology. You don’t need a computer — no need to sync to a desktop or lappy, but you can if you want to. Amazon’s Jeff Bezos says Kindle is a service. Hardware is not the star, writing is. What a great time to be a writer! The Kindle has limitations as does every other device out there, and Kevin Kelly comments that he is still waiting for the cloudbook that will do everything. Me, too. Imagine a bigger iPhone that is also a reader, plus computer, plus cellphone, plus internet access, plus toaster. Okay, maybe not the toaster, but everything else. It’s coming. Kevin Kelly writes about this Always On Book and has blogged about the future of books here and here. I love his labels — People of the Book and People of the Screen. What are the implications for church? This is the shift in the creation, storage, distribution, remixing, and redistribution of information. It is democratic, not top down, not expert-driven, and uncontrollable (at least by those who might want to control the free-flow of information). What do you think the possibilities are? Two articles from PSFK, plus one from Kevin Kelly illustrate that how the way we relate to one another is changing, especially the younger you are. NY City high school students who get good grades will receive a cell phone and free ringtones or minutes, even though cell phones are banned in school. They can’t use them there, but it proves the power of the cell phone among teens as a primary communication device. The next stage in human technological evolution is a single thinking/web/computer that is planetary in dimensions. This planetary computer will be the largest, most complex and most dependable machine we have ever built. It will also be the platform that most business and culture will run on. The web is the initial OS of this new global machine, and all the many gadgets we possess are the windows into its core. Future gizmos will be future gateways into the same One Machine. Designing products and services for this new machine require a unique mind-set. Kelly goes on to describe the immensity of the One Machine and predicts that sometime between 2020 and 2040, the One Machine will exceed the computational power of all humans combined — over 6-billion human brains. Imagine that on your DSL connection. Computers will become gateways to the One Machine where all computing will be done online. Google is already headed there with Google Docs, gmail, google maps, contacts, and about 30 other apps they have designed. All accessible from anywhere on earth from any computer. And the Google gPhone will be able to access all of it, anytime, anywhere, on any system, with any handset. Begin to see the ramifications? But lost in the hoopla about the gPhone was the Google announcement that they are developing Open Social which will allow any website to create its own Facebook application. So, your church could develop it’s own social network. And those in the network would not be restricted to geographic proximity — they could live anywhere. And, theoretically, your church Facebook could be linked to other churches of similar flavor, or other ministries, or sold to advertising companies to generate revenue for the church, or have ads pop-up when individuals log on to their church account. Some pretty wild and scary applications could result. This is where we are heading. This also makes the conversations we have at church about worship styles or other issues pale by comparison. What do you see implied in this new way we will relate to one another for the future of the church?